1) Healthy Body, Healthy Mind- You can be one of the most intelligent, ambitious, and experienced people on the planet but if you don’t take care of your body, you aren’t going to be that successful for long. For optimal mental function and getting dates, you need to constantly fuel your mind AND body with healthy workouts, nutrition, rest, stress relief, and physical activity. Lower blood pressure, reduced stress, increased energy levels, better lung function, and improved oxygen transport to the brain are all GOOD THINGS for any man. 2) Ladies Love Healthy and Fit Men- Unless they are gold diggers and then they want you dead as soon as possible, and obviously that means they weren’t worth dating or marrying in the first place. Also, what woman wants a fat sweaty winded guy on Lipitor and Viagra gyrating on top of them naked for 45 seconds and then falling asleep? No women with good looks, intelligence, or self-esteem that’s for sure. Also, the healthier and better shape you are, the better shape your girlfriend or wife will end up being in most situations. If you start getting fat and lazy, she may soon follow and then you are both just a bunch of chumps. If you don't have a girlfriend or wife and you'd like one that doesn't look like a chunkernutter that chases her milkshake with a cigarette, you better start getting fit first. Individuals who are healthier and fitter not only look like better candidates for jobs or relationships, they will have much more self-confidence and ambition than a hobbled wheezing shlub, all other things being equal. Sometimes individuals get passed over for opportunities they are qualified for because they don’t necessarily “look the part”. That isn’t always fair but that is the way the world works and it isn’t going to change. Put the odds in your favor and get rid of that gut, build up those shoulders, and strengthen that respiratory system. 4) Be A Better Sports Fan - Most guys out there are big sports fans, which is great. But I personally get a little bit annoyed when these “armchair jocks” are complaining about the lack of toughness and hustle of a player when they themselves haven’t been able to tie their shoes for 5 years because of their immense gut. I love sports and fantasy football, but you can’t complain about player coming into training camp in bad shape when you yourself are a whale that gets winded just deciding which quarterback to draft. Who knows, maybe even go out and PLAY the sports that you like to watch, even if it’s just for fun. You will certainly be a lot more competitive and less likely to get injured if you are engaged in a proper workout regimen. Also, if you can't throw a football, shoot a basketball, run 100 feet, or do some pushups without keeling over, you automatically lose some man points. 5) It’s Hard To Be The Man When You’re Dead - Guess what, improving your health and fitness levels will help you live longer! Proper exercise and nutrition can help reduce the risk and symptoms of so many diseases and conditions including cancer, Alzheimer, depression, anxiety, obesity, heart disease, hypertension, diabetes, and the list goes on and on! A rationale man will take advantage of immense benefits of proper workouts and diet. Don’t end up like some of the legends that could have been even greater had they taken care of themselves physically and mentally like Elvis, Kurt Cobain, Heath Ledger, and the list goes on and on. 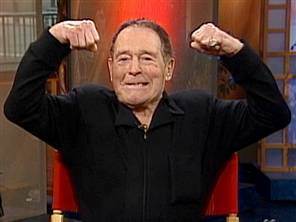 Look at Jack Lalanne, lived to workout until the age of 94! Now that guy is the epitome of “The Man”. So get out there and go for a run, join a pickup basketball league, throw the football around with your kid, and buy some healthy food instead of another bucket of fried chicken. Your body, your mind, your success, and your manliness will thank you. I hope you enjoyed this article about how to live healthier on a frugal budget and maximize your results!